Kevin De Bruyne returned from injury as Manchester City beat Burnley with Sergio Aguero among the goalscorers. City doubled their lead in controversial circumstances in the 54th minute, Burnley’s defence stopping in their tracks as Sane went down under Jack Cork’s challenge. Sane’s corner was only half-cleared and Fernandinho side-footed a 20-yard rocket into the top-right corner. 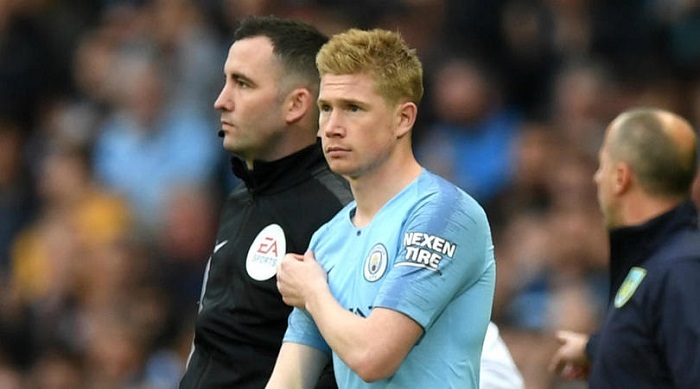 With City struggling to show their Premier League form in the Champions League, De Bruyne’s comeback appears to be at the perfect time for Guardiola. De Bruyne is the conductor who makes City tick and if they are to compete on multiple fronts this season, he will be key. With City sitting pretty at the top of the league, their ability to absorb De Bruyne’s loss has depended much on the form of both David Silva and Bernardo Silva. And the two midfielders were at the top of their game again, the Spaniard recording assists for City’s first two goals while the Portuguese added his third Premier League goal of the season. The match would have had a different complexion had referee Jon Moss judged Kompany’s first-minute tackle on Lennon more harshly. The City captain appeared nervy throughout and later survived penalty appeals for a handball.